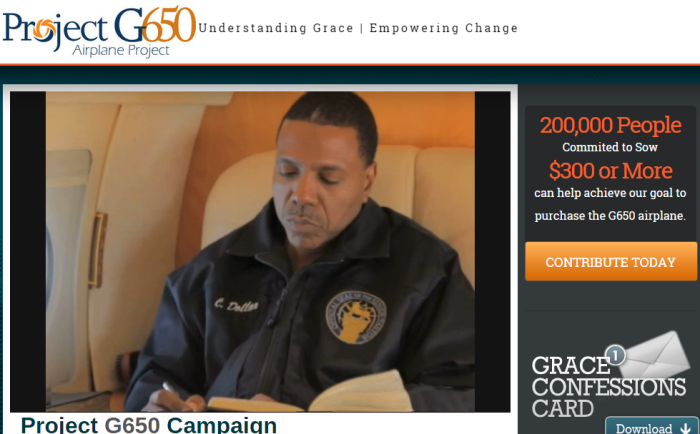 Popular televangelist and founder of World Changers Church International, Creflo Dollar, is now hoping to get 200,000 people to donate $300 each so he can buy a brand new luxurious $65 million Gulfstream G650 airplane for his ministry, which last year had billionaires reportedly waiting in line to get one. An appeal on his website to fund the purchase of the multimillion dollar airplane noted that the appeal was triggered by a recent engine failure on his current carrier that could have resulted in a tragedy had it not been for his skillful pilot. "The ministry's current airplane, was built in 1984, purchased by the ministry in 1999 and has since logged four million miles. Recently on an overseas trip to a global conference, one of the engines failed. By the grace of God, the expert pilot, who's flown with Creflo for almost 20 years, landed the plane safely without injury or harm to any passengers," said the appeal. 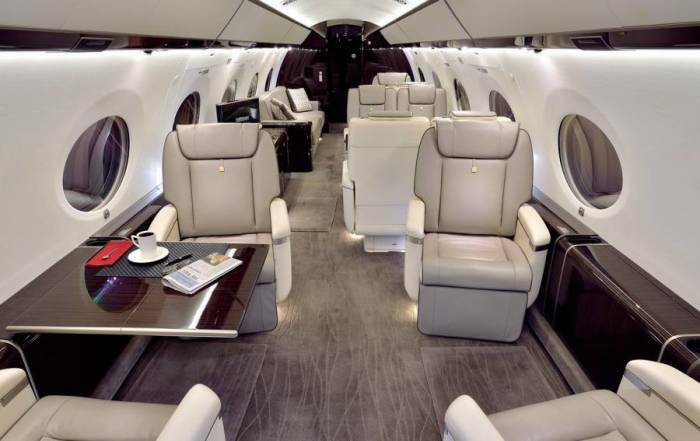 Dollar insisted that he needs one of the most luxurious private jets made today in order to share the Gospel of Jesus Christ. "Due to this recent incident coupled with the 31 years the airplane has been in service, we believe it is time to replace this aircraft so that our Pastors and staff can continue to safely and swiftly share the Good News of the Gospel worldwide. Believe it or not, there are still millions of people on this planet who have never heard of Jesus Christ and know nothing of His greatness. Our hearts desire to see precious lives changed and snatched out of darkness and thrust into His marvelous light! We need your help to continue reaching a lost and dying world for the Lord Jesus Christ," the appeal continued before asking supporters of the ministry to sow a $300 seed into the airplane fund, billed Project G650. 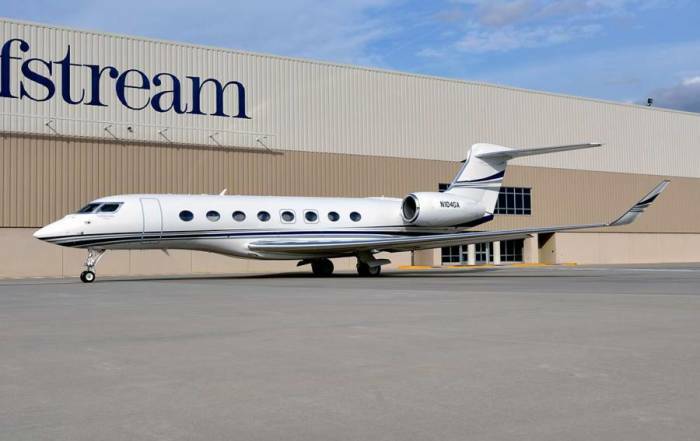 "The mission of Project G650 is to acquire a Gulfstream G650 airplane so that Pastors Creflo and Taffi and World Changers Church International can continue to blanket the globe with the Gospel of grace. We are believing for 200,000 people to give contributions of 300 US dollars or more to turn this dream into a reality — and allow us to retire the aircraft that served us well for many years," the appeal noted. Apart from its price tag, this aircraft isn't cheap to maintain, and according to savannahnow only about 100 of them had been built as of November 2014. The Christian Post reached out to World Changers Church International Thursday for comment on how much of the $65 million has been raised so far but this reporter was repeatedly directed to a customer service line which went unanswered. In an interview with World Changers Church late last year, representative Kayla Dollar indicated to CP that spreading the Gospel, while convenient for Pastor Dollar, does not come cheaply to the churches where he ministers because they have to partially foot the cost of his fuel bill. "He does not have a set honorarium now but he does just ask for half of his fuel to be paid while travelling and then anything else if you want to add just as a love offering, would be fine," she explained. When asked how much the fuel bill to New York City would be, she explained that the full cost of fuel for travelling to New York City was $9,500. "The cost is $9,500 so he would ask for half of that so $4,750," she said. That price, she noted, would remain fixed regardless of the size of the crowd.